All meetings start at 7pm and are held in the Bankers Room at the Centennial Library, Church Street, St.Catharines. 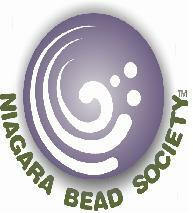 "To share the creative artistry of beading in a fun, supportive environment"
In 2001, the Niagara Bead Society was formed by a small group of beadlovers and artisans to build a sense of community among those that have a passion for beads and their related application. The main objectives of the founders were and still are: Relaxation, Ideas, Creativity, Good Conversation, Sharing Artistry, Laughing, Casual, Leisure & Pride. Our members’ interests represent bead-related topics and subjects that range from the historical and cultural study of beads...to the design and creation of beads and jewellery...to simply wearing and collecting the work of bead artisans and craftspeople. Since its inception, the Niagara Bead Society has steadily prospered in number and talent. We are lucky to enjoy a diverse group of people with a large variety of specialties in the beading and jewelry-making world. Our membership includes bead embroiderers, glass flamework bead makers, bead weavers (on- and off-loom), polymer clay bead makers, wireworkers, makers of chain maille, store owners, professionals, students and many others.